Semiconductors are at the heart of modern living. Almost everything we do, be it work, travel, communication, or entertainment, all depend on some feature of semiconductor technology. 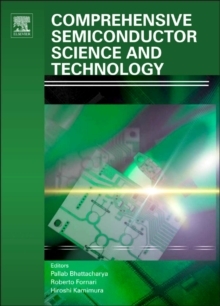 Comprehensive Semiconductor Science and Technology captures the breadth of this important field, and presents it in a single source to the large audience who study, make, and exploit semiconductors. Previous attempts at this achievement have been abbreviated, and have omitted important topics. Written and Edited by a truly international team of experts, this work delivers an objective yet cohesive global review of the semiconductor world. The work is divided into three sections. The first section is concerned with the fundamental physics of semiconductors, showing how the electronic features and the lattice dynamics change drastically when systems vary from bulk to a low-dimensional structure and further to a nanometer size. Throughout this section there is an emphasis on the full understanding of the underlying physics. The second section deals largely with the transformation of the conceptual framework of solid state physics into devices and systems which require the growth of extremely high purity, nearly defect-free bulk and epitaxial materials. The last section is devoted to exploitation of the knowledge described in the previous sections to highlight the spectrum of devices we see all around us.